Washington DC is often overlooked as a travel destination due to its more glamourous neighbours. However the city has a lot of offer visitors, as not only is it rich in political history and houses some awe-inspiring museums, it is also full of hidden foodie gems. Here is my guide to seeing the best of what Washington DC has to offer in 24 hours! Even before landing at Dulles International Airport I was excited at the prospect of exploring Washington DC. After a fairly comfortable flight, I checked into my hotel in Rosslyn, Arlington, a few short train stops away from The White House. I got in late in the evening so I decided to have an early night and start afresh in the morning. After a typically American breakfast of buttermilk pancakes and black coffee, I headed straight to the nearest metro station to purchase a Smartrip card. These work pretty much like an oyster card and can come pre-loaded with credit to make using public transport easy. There are machines at every metro and they take cash or credit card. I definitely recommend getting one of these cards as you will be traveling around in a similar fashion as you would in Central London. I must admit, when I saw the metro station I was taken aback at how dated and bare it looked. A seemingly never-ending escalator took me down underground to a dimly-lit platform with only shades of grey and orange around me. There was no advertising, no modern electronic notification boards and seemingly no people around. It was quite eerie and surprising and the trains themselves were quite the same. Nevertheless, the metro is easy to use and trains run quite regularly. There are colour (or color) coded lines similar to the London underground although I would recommend downloading a metro map as it’s quite hard to pinpoint one once you’re on the train and single is few and far between. I took the silver line to Federal Triangle station and headed to my first stop - The National Museum of African American History and Culture (NMAAHC), a Smithsonian Institution museum which opened in September 2016. The building itself is beautiful and the location on the National Mall represents the past, present, and future of the African American experience. Looking north from the building, visitors can see the White House, which made history in 2008 with the election of the country's 44th president, Barack Obama. Rising to the east beyond the National Mall and other Smithsonian museums is the U.S. Capitol, seat of the nation’s legislature. 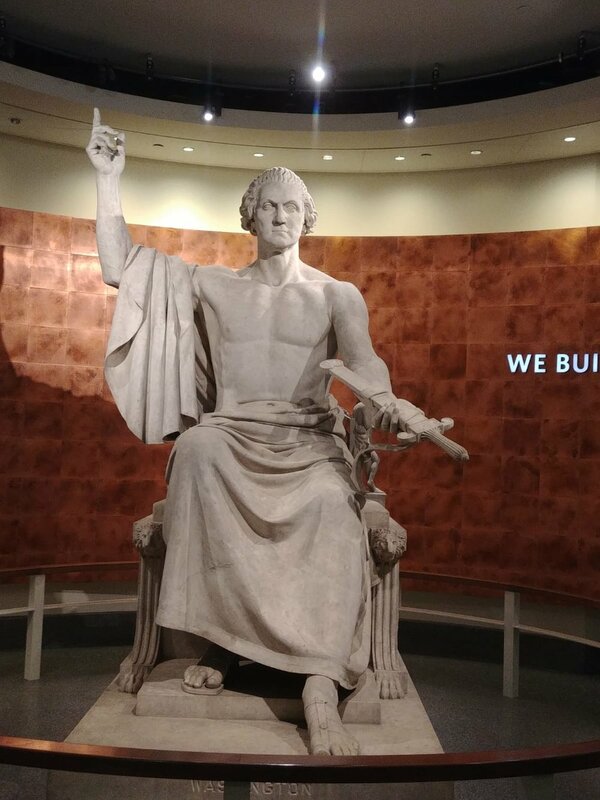 To the south and west are monuments and memorials to Thomas Jefferson, Martin Luther King Jr., Abraham Lincoln, and George Washington, whose contributions to African American history and culture are explained in the museum. The museum itself opens at 10am but in order to avoid queues I would recommend getting there at least 30 minutes before as the museum is extremely popular with over 4 million visitors already being through the doors within two years. This was a museum I was really excited about visiting and knew I was in for a mix of emotions. I started 80 feet below ground to where the reality of the beginning of the African American experience sets in- the slavery exhibition. This was such a moving experience and made me realise how slavery not only shaped African Americans but the whole country itself. The way in which the museum covered the history was incredible. From a full scale replica house showing how slaves in the south lived to the actual coffin of Emmitt Till whose untimely and horrific death caused waves throughout America. As you rise up through the museum you actually rise up through the celebratory history of African Americans. There are exhibitions on music, sport, movies and much more. 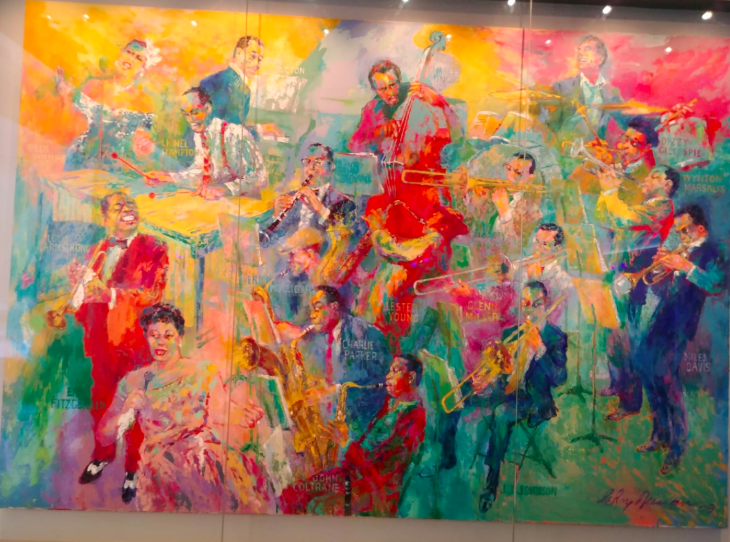 Everywhere you look there are visual, audio and kinetic experiences covering so many incredible stars - Oprah Winfrey, Muhammed Ali, Michael Jordan, Michael Jackson, Prince, Whitney Houston, Aretha Franklin…the list goes on and on. After spending a good three hours in the museum I was ready to eat! I stopped at the Sweet Home Cafe located inside the museum. Sweet Home Café showcases the rich culture and history of the African American people with traditional, authentic offerings as well as present-day food traditions. Four distinct stations each tell the story of the regional offerings - The Agricultural South featuring staples such as Lexington Style BBQ Pork Sandwich, with Slaw, Pickled Watermelon Rind, and Potato Salad, The Creole Coast which includes Pan-fried Louisiana Catfish Po’boy with Smoked Red Pepper Rémoulade and Green Bean Pickles, The North States including Smothered Turkey Grillades with Fried Apple, Sage Gravy and Johnny Cakes, and finally The Western Range which includes BBQ Beef Brisket Sandwich with Sweet Potato Bun, Charred Peach and Jalapeno Chutney. I decided on the fried buttermilk chicken with collard greens, corn bread and washed down with old fashioned root beer. The food was delicious and affordable with friendly staff who assisted me with my choice. After leaving the museum I checked out the Washington Monument which was literally across the road. Built to commemorate George Washington, the first President of the United States the Monument is impressive up close and I was surprised to hear that it is the world's tallest predominately stone structure and the world's tallest obelisk standing at 554 feet 7 inches. My next stop was the Capitol Hill, which was a short walk away. The United States Capitol, often called the Capitol Building, is the home of the United States Congress, and the seat of the legislative branch of the U.S. federal government. The tour is free, includes a 13 minute orientation film plus a 45 minute walking tour, and runs throughout the day but you must reserve your spot on the tour online. The tour is very popular and there are limited numbers so if you are with a big group I’d recommend reserving your place as soon as you can. The tour guide was very informative and explained why Capitol Hill is a symbol of the American people and their government, the meeting place of the nation's legislature. It is an impressive building which also houses an important collection of American art and is a working office building as well as a tourist attraction visited by millions every year. We even got to see Speaker of the House Paul Ryan walk past with his entourage which was quite surreal to say the least! After this I decided to check out one last museum before dinner and headed to the Holocaust Memorial Museum which was another short walk away and which tells the history of the Holocaust from 1933 to 1945. I knew that this would be an emotional and harrowing experience but I also knew it was a necessity on this trip as I believe this deeply shocking and horrific moment in history must be remembered by future generations. The Holocaust is presented in a chronological history over three floors through artifacts, photographs, films, and eyewitness testimonies. I recommend that all visitors to DC make a stop at this museum as I learnt more about the Holocaust through the self-guided exhibition than I did at high school. The drawings and pictures by the children in the concentration camps really hit home the most. Unfortunately the museum closes at 5.30pm so I did have to rush near the end. I would recommend spending at least two hours at the museum. My next stop was 1600 Pennsylvania Ave - The White House. I took a short metro ride to McPherson Square station and took a short walk in the direction of armed guards and police. Although it’s quite impossible to get close to the building these days, I found the White House to be quite small and disappointing, although I’m not sure what I was expecting after seeing it in various movies like Independence Day and shows like House of Cards. After a few photos and it was time for dinner and I had booked a table at The Old Ebbitt Grill, Washington's oldest saloon. Founded in 1856, the restaurant is a few streets away from the White House and is iconic in it’s own right. The restaurant was a must for me and I made sure to book a month in advance as I knew how popular a destination it is for locals and tourists alike. The restaurant has a wide selection of sea food and shellfish but I decided to try the Spicy Sausage Garganelli - A pasta dish with fennel sausage, San Marzano tomatoes, Tuscan kale, chili flakes, and Pecorino Romano. The pasta was absolutely delicious, especially with a couple of sangria cocktails! After the meal I headed to Georgetown, a trendy district of DC where I was lucky enough to be invited to a private piano recital by Jason Solounias, the Executive Director for the Puerto Rico International Piano Festival and the Competition Director of the Kosciusko Foundation Chopin Competition for Young Pianists. Jason has performed across the United States and Europe was nothing short of brilliant, playing a selection of pieces from Franz Liszt and Heitor Villa-Lobos. During the performance I had to pinch myself to make sure I was really in a private home in DC watching a professional pianist perform a few feet away from me! Having never seen a piano recital up close before I was blown away, it was a truly mesmersing experience and gave me a new found appreciation for the piano and orchestral music. Although it was only a day, I had an amazing time in Washington DC. I know there’s so so much more to see of the city but that is the best excuse to go back. Until then, I will look back at the one day I spent in the US Capital with a smile.